For those of us unable to attend New York Comic Con this weekend, Bottleneck Gallery has a little something special for us! That’s because they’re releasing three of their New York Comic Con 2018 exclusives online, including this amazing E.T. The Extra-Terrestrial Movie Poster Screen Print by Laurent Durieux. Doesn’t this long awaited poster just warm your heart? Man this was sooo worth the wait! 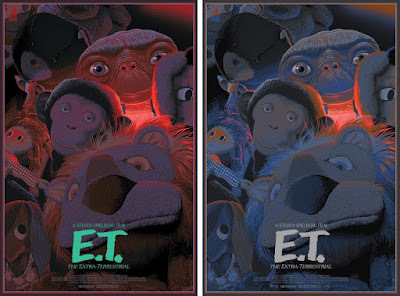 The New York Comic Con 2018 Exclusive E.T. The Extra-Terrestrial by Laurent Durieux is a 24”x36” hand numbered glow in the dark screen print. The Regular Edition is limited to 350 pieces and retails for $65, while the Variant is limited to 150 pieces and retails for $75. Both versions will only be available at the Bottleneck Gallery online store, and go on sale at 12pm EDT today, Wednesday, October 3rd.